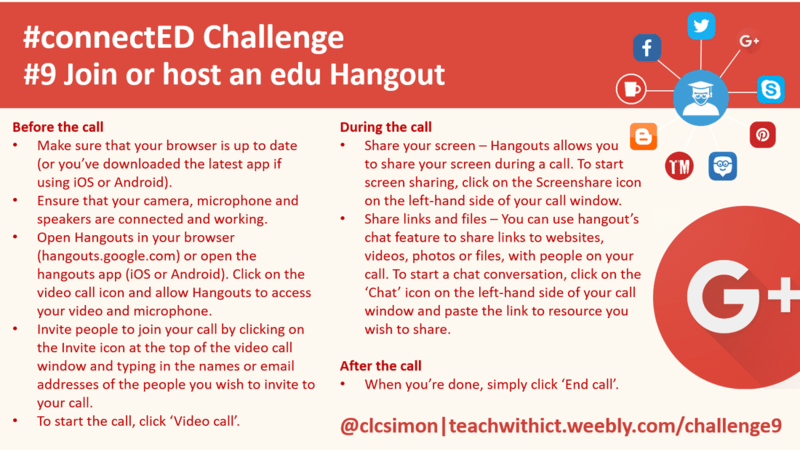 Challenge 9: Join or host an education/mystery Hangout. Google+ Hangout is a free video chat service which allows up to 10 people to video conference at one time. Although primarily a video conferencing service, hangouts also allow you to participate in text-based or voice only chats. There is also a special hangout that broadcasts via YouTube called ‘Hangout on Air’. With ‘Hangout on Air’ you can organise public CPD events/webinars via YouTube and your Google+ page. Many educators are using the benefits of tools such as Google Hangouts for their own Continuing Professional Development (CPD). With group hangouts, it is possible to connect with experts or attend CPD events without having to leave the comfort of your own home / classroom. Login to your Google+ account (https://plus.google.com/). Click inside the Hangouts ‘Search bar’. For each person in your group, type their name or email address. Check the box in front of each person’s name. Type your message, and press the return key on your keyboard. Make sure that your browser is up to date (or you’ve downloaded the latest app if using iOS or Android). Ensure that your camera, microphone and speakers are connected and working. Open Hangouts in your browser (hangouts.google.com) or open the hangouts app (iOS or Android). Click on the video call icon and allow Hangouts to access your video and microphone. 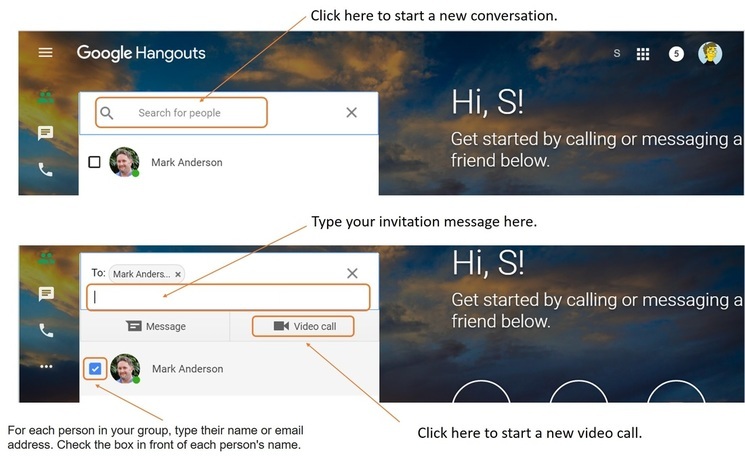 Invite people to join your call by clicking on the Invite icon at the top of the video call window and typing in the names or email addresses of the people you wish to invite to your call. To start the call, click ‘Video call’. to share your screen during a call. To start screen sharing, click on the Screenshare icon on the left-hand side of your call window. Share links and files – You can use hangout’s chat feature to share links to websites, videos, photos or files, with people on your call. To start a chat conversation, click on the ‘Chat’ icon on the left-hand side of your call window and paste the link to resource you wish to share. When you’re done, simply click ‘End call’.